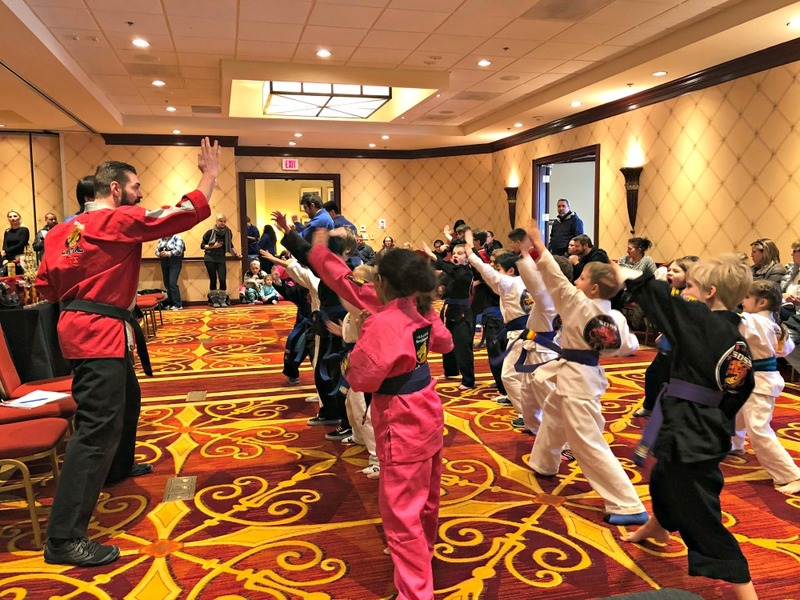 Hundreds of competitors, ranging from Age 4 to Age 60, came to Greenwich to compete in the SDSS Connecticut State Tournament. Students from Greenwich, Wilton, Ridgefield, Newtown, Fairfield, Darien, and Westport competed earlier this spring to earn a place at the state event. Students competed in hand forms, sparring, defensive techniques, weapons forms, and sword sparring. The event was highlighted by an instructors’ demonstration, where students had a rare opportunity to see their teachers’ perform. The trip to States and Nationals begins right after the previous year’s Shaolin Olympics. Instructors and students set martial goals. Next, students focus on regional competition, Here, students learn to compete and refine their art. They learn sportsmanship and working toward a goal. Best of all, they get to see students in neighboring towns who work on the same material they do every week in the studio. A select few from regionals qualify for states. From each state event, students can earn a slot at the Shaolin Olympics Nationals later in the year. The Shaolin Olympics and Open Tournament allow students multiple opportunities to compete. Some qualify for the prestigious Shaolin Olympics National Tournament, others participate in the International Open Tournament, and dozens choose to compete in both. Grandmaster DeMasco hosts that event. It is the highlight of our SDSS competition year and a celebration of a martial journey that never ends. The SDSS Martial Arts experience is all about the journey. Every student learns something new every day. Even Grandmaster DeMasco and Senior Master Mikael Meyer study and practice daily. This cycle of setting goals, then achieving them, is essential for student growth. To learn more about the next SDSS competition, contact your local studio and speak with your instructor.